This 1965 LIFE photo was taken in Dong Xoai nearly four years before my arrival in Vietnam in the spring of 1969, 150 miles further south in the Mekong Delta. It reminds me of scenes I witnessed during the immediate aftermath of several daylight bombing attacks on totally undefended village targets in Vinh Long and Phong Dinh Provinces in the Delta. I saved this photo for my personal Vietnam files after discovering it in the 1970s. In my horrible experiences, however, I have no memory of seeing any villagers on their feet, or any buildings standing intact. 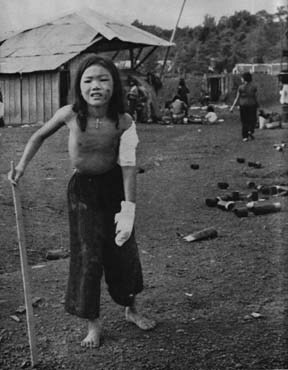 The villages were small, no larger in size than a baseball stadium, built on mounds in rice paddies, with somewhere between 100 and 200 residents caught as easy prey in the pilots’ targeting. There were virtually no men visible. Most of the villagers I saw were either relatively young females and children, or elderly. No weapons were visible and each village was clearly undefended. I do remember one small girl trying to stand up on a stick similar to the girl shown in the LIFE photo here, though she kept falling down. Villagers and farm animals who had not immediately died from the bomb shrapnel or napalm, or Gatling machine-gun rounds from the low-flying fighter-bomber planes were simply lying on the ground left to die in their painful misery. There were certainly no evacuation helicopters or ground ambulances waiting to aid the maimed and injured. This scene more than any other has haunted me through all the years since. My Vietnamese lieutenant cohort and I, incidentally assigned this mission as an extra duty, simply documented the pilots’ bombing "successes" during our eerily safe daytime mission. After quickly recording the first of these "successful" bombings, we departed in my USAF jeep for the 45-minute return trip on a rutted dirt road south to the Bassac River ferry crossing to nearby Can Tho City, then the final five miles north to our home base at Binh Thuy. During the ride back to the base, there was no discussion of calling in help for those villagers who might be saved by medical intervention. Everyone was considered a "communist" and the more dead the better. I was in shock, and had gagged and wept in the villages. My Vietnamese sidekick was ecstatic over the "victory." I did not have sufficient composure to insist on assuring medical follow-up to the wounded in the decimated villages. I began speaking out against the bombing missions after realizing the intention was to deliberately annihilate civilian populations in whole regions of the Mekong Delta. During several subsequent missions, I refused to travel close enough to the bombed villages to actually tabulate detailed destruction and body counts. War! It changed me forever. If humanity wants to continue evolving on this awesome journey called life that has creatively unfolded over our 15-billion-year evolutionary history, then we will have to realize that war will inevitably cut this journey short for all of us. We must choose to end our addiction to war. Only a quantum leap from a technozoic, or anthropomorphic way of thinking, to an ecozoic, or biocentric consciousness, will save us from the extinction that is now staring us in the face. Only when we internalize our own sacredness within the larger sacredness, and pursue justice for all life, will there will be peace. War shall be no more. The continuation of life requires war’s termination once and for all. This entry was written by brian, posted on at 6:11 am, filed under The Most Dangerous of Rogue Nations: The United States, Vietnam. Bookmark the permalink. Follow any comments here with the RSS feed for this post. Post a comment or leave a trackback: Trackback URL.